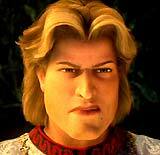 The film opened during a dinner performance in the Medieval Times Theatre, where Prince Charming (voice of Rupert Everett) was enacting on stage his rescue of Princess Fiona from the dragon-guarded castle tower on his valiant steed Chauncey. Many Fairytale characters were seated at a table in the audience. A man dressed in a bad ogre costume, to appear like Shrek, came on the stage. Things weren't going well (the audience was distracted by a waiter singing Happy Birthday, and part of the stage collapsed), and the spectators began laughing, upsetting Prince Charming - and he threatened them with his twisted sword: "Someday, you'll be sorry." He left the stage in a huff. In his alleyway dressing room before a broken vanity mirror, he sobbed: "Mommy!" A picture of his mother, Fairy Godmother was attached to the frame, with the words: "Don't Stop Believing! Mommy's little Angel." He suddenly became determined, claiming that he wouldn't be displaced from ascending to the throne: "I can't let this happen. I am the rightful King of Far, Far Away." A newspaper blew into his face, with the headlines: "King Royally Sick - Shrek and Fiona Fill In For Ailing King. Lazy ogre son-in-law Shrek (voice of Mike Myers) and daughter Princess Fiona (voice of Cameron Diaz) were filling in for the ailing King Harold (voice of John Cleese), and residing in the Far, Far Away kingdom's royal castle. They were assisted by Puss In Boots (voice of Antonio Banderas) and faithful companion Donkey (voice of Eddie Murphy), and reminded that they had to attend various functions that day. 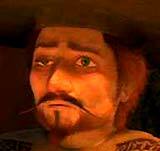 "Royal Pain" by the Eels played as Shrek acted disastrously as King -- he accidentally stabbed a knight during a knight ceremony, and at the dock during a boat christening, he sank the ship with a heaved bottle of champagne. 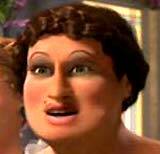 Shrek and Fiona were taken to a dressing room, where make-up specialist Raul primped them to look like royal figures, and they were awkwardly dressed in uncomfortable Renaissance outfits. Fiona asked: "Is this really necessary?" 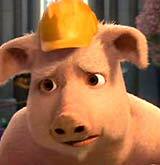 A frustrated Shrek replied: "I don't know how much longer I can keep this up, Fiona." Their introduction to a ballroom full of guests was a disaster - a series of mishaps caused the curtains to be set on fire, and the stage collapsed. Afterwards, Shrek told Fiona: "That's it. We're leaving...I am an ogre. I'm not cut out for this, Fiona, and I never will be." She replied: "A couple more days, and we'll be back home in our vermin-filled shack strewn with fungus and filled with the rotting stench of mud and neglect." She hinted that she might want a family, but he was reluctant about having babies: "They just eat and poop, and they cry...", especially an ogre baby: "They extra-cry and they extra-poop." The couple was summoned to the King's chambers, where the Frog Prince/King Harold was dying on a lily pad, although he had a "matter of business to attend to." He told Shrek about the need for a new king: "You and Fiona are next in line for the throne," but Shrek replied that he didn't think it was "a good idea" for an ogre to be king. There was only one other remaining heir for the job -- and as he gasped and died, the King specified the heir to be his nephew, Arthur. A funeral was held at the castle's pond where a frog chorus sang the Wings' song "Live and Let Die", as the King in a shoebox (labeled 'Ye Olde Foot Locker') was placed on a lily pad and floated onto the pond. Meanwhile, vengeful Prince Charming rode to the Poison Apple Tavern, where during the Unhappy Hour, a Singing Witch entertained the patrons with "I've Never Been to Me" (performed by Nancy Wilson). Mabel the Ugly Stepsister (voice of Regis Philbin) served him at the bar, where he bought a round of drinks (Fuzzy Navels) for various Fairytale Villains, knights, pirates, witches, and more wronged characters, including: Captain Hook (voice of Ian McShane), the Evil Queen (voice of Susanne Blakeslee), Stromboli the Puppet Master (voice of Chris Miller), and a Cyclops (Mark Valley). Charming persuasively convinced them to join his cause, since they were all losers: "There are two sides to every story, and our side has not been told. So who will join me? Who wants to come out on top for once? Who wants their 'happily ever after'?" The rowdy crowd began a brawl as they cheered his words about stealing back their 'happily ever after'. At the dock, the Queen, Fiona and a number of Fairytale Creatures (the Three Blind Mice, Dragon and the six Dragon-hybrid baby Dronkeys, and Puss' many admiring felines) assembled to wish Shrek, Donkey, and Puss In Boots a bon voyage as they set sail on the boat of Puss's cousin. Their mission was to retrieve Fiona's cousin Arthur - the "perfect choice" to run the kingdom. As the boat left, Fiona shouted that she was pregnant and that Shrek was going to be a father soon. On the journey, Shrek experienced a nightmare that he was at home in his swamp abode, where a baby ogre in a carriage vomited directly into his face, and then when he looked around, he saw that his home was filled with crawling babies. The creatures were destroying the furniture, putting themselves continually in lethal danger (falling or catapulting, releasing sharp knives, lighting matches, etc.) - and then suddenly, a flood of ogre babies filled his home. As he fled, he found himself naked on stage at his high school graduation ceremony, in front of dozens of baby ogres laughing at him. He thought he awoke from a bad dream, but saw that both Donkey and Puss had baby-ogre faces. Then, at the sound of a fog horn, Shrek really woke up and bolted upright, breathing heavily -- "I can't believe I'm gonna be a father." 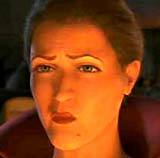 Donkey sang "Cat's in the Cradle" (by the Chapins), to supposedly make Shrek feel better. 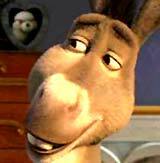 Donkey advised: "Having a baby isn't going to ruin your life...Nobody said it was gonna be easy. But at least you got us to help you out." The group arrived at Worcestershire Academy, a majestic castle on a bluff overlooking the shore. It was an elite boarding school, where cheerleaders were practicing inside the compound, students were instructed in carriage-driving education, a few stoners emerged from a medieval style VW-van, and two females were speaking "totally" like Valley Girls. 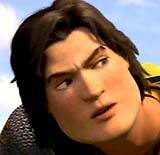 They located Arthur Pendragon (nicknamed "Artie") (voice of Justin Timberlake) in the arena's Jousting Range, but he wasn't the expected strong and handsome Bold Knight (named Lancelot) (voice of John Krasinski), but a skinny teenaged "dork" who was running away to the school yard. 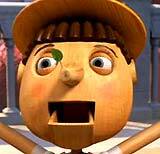 In the school's gymnasium, Principal Pynchley (voice of Walt Dohrn) was about to announce the winner of the new Mascot Contest - when Shrek arrived and declared himself the school's mascot. When he asked the location of Arthur Pendragon, the boy was found hanging helplessly from a basketball hoop - the object of a student prank who was laughed at by the entire student body. Shrek told Arthur: "You're the new king of Far, Far Away," as the other students reacted with disbelief, while Lancelot joked: "More like the Mayor of Loserville." 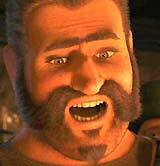 Shrek reaffirmed the fact that Artie was the king's only heir: "You've got a kingdom to run....The one and only." Before leaving, Artie lectured his fellow students about the lesson to be learned: "Maybe the next time you're about to dunk a kid's head in a chamber pot, you'll stop and think: 'Hey, maybe this guy has feelings. Maybe I should cut him some slack. 'Cause maybe, just maybe, this guy's gonna turn out to be, I don't know, a king? And maybe his first royal decree will be to banish everyone who ever picked on him.' That's right, I'm looking at you, jousting team...Enjoy your stay here in prison while I rule the free world, baby!" In the castle's library, a baby shower was held for Princess Fiona by Queen Lillian, attended by various Fairytale creatures, including Pinocchio (voice of Cody Cameron), Snow White (voice of Amy Poehler), Cinderella (voice of Amy Sedaris), Sleeping Beauty (voice of Cheri Oteri), Rapunzel (voice of Maya Rudolph), the Gingerbread Man (voice of Conrad Vernon), and Dragon, etc., and presented her with gifts, mostly for burping and cleaning up her future baby. Meanwhile, Charming and the other Fairytale villains on flying broomsticks approached in the sky above Far, Far Away. The talking Evil Trees were dropped like parachuting bombs, and landed with others in the Rodeo Drive area of the kingdom to pillage the area. They then proceeded to the castle, where the female princesses and Fiona cleverly escaped through a secret passageway. 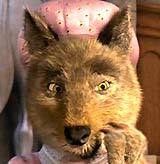 The villains captured Dragon, and forced one of the Three Little Pigs (voice of Cody Cameron), one of the few remaining Fairytale creatures that were pretending to have a tea party - to reveal that Shrek had left to bring back the next heir to the kingship. Charming ordered Captain Hook to "get rid of this new king," but to bring Shrek alive to him. On board the ship as they sailed home, Artie was disbelieving that he was to be a king, but also excited: "This is gonna be huge. Parties, princesses, castles. Princesses." Donkey added: "You'll be living in the lap of luxury." But Puss and Donkey also scared him with talk about the king's official food tasters to make sure it wasn't poisoned, about bodyguards, and about his major responsibilities (to avoid famine and plague). Shrek was worried: "We don't want Artie here getting the wrong idea," but the boy had already panicked, taken control of the ship's wheel, and vowed to go back. The ship crashed on jagged rocks, and they found themselves on a nearby beach, where Artie hiked away from them, and Puss speculated: "Maybe it's for the best. He's not exactly king material." The group followed Artie up a trail to the abode of Artie's retired, bearded and elderly magic teacher Merlin (voice of Eric Idle). 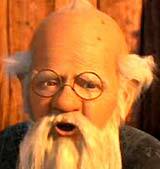 Merlin promised to lead them back to Far, Far Away, if the quarreling group would take a journey into their soul. As a fire blazed at Merlin's camp, he had everyone look into the "Fire of Truth" to interpret its billowing smoke as Rorschach images. Artie saw a father bird deserting a little baby bird in a nest -- as the little bird struggled to fly. 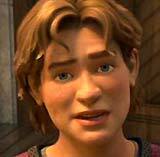 Shrek attempted a "heart-to-heart" chat with Artie, interpreting that the young boy had been abandoned by his father, and therefore felt unready and scared to be king, as Artie confirmed: "I'm not cut out for it, and I never will be." But Shrek convinced him by encouraging him "to trust who you are." In the sewer catacombs below the castle, the princesses and Fiona made their way to an exterior exit, and emerged in the main castle courtyard, where the construction of a large outdoor theatre (the Far Far Away Theatre at the Charming Pavilion) was underway. Rapunzel betrayed the group to Prince Charming and the princesses were captured. Rapunzel and Charming shared a long kiss together, revealing that they were in love with each other, and that he was planning on having Rapunzel as his new Queen of Far, Far Away. He also predicted that once Shrek set foot in the kingdom, he was doomed. The group of ladies were locked away in a prison cell. Shrek and his pals were tracked to the woods at Merlin's camp by Captain Hook and his pirates (and some Evil Trees), and then attacked. Hook had threatened that Charming was making himself King of Far, Far Away. Fighting back, Shrek was able to force the defeated villains to retreat, but he was very worried about the safety of Princess Fiona. He told Artie, for his own safety: "Get yourself back to Worcestershire, kid," but Artie had a better idea. He pretended to be distraught and convinced Merlin to provide a magic spell to get everyone back to Far Far Away, where they could defeat the "really bad man" doing "mean things to good people." The magician's spell worked and they were transported to the forest near Far, Far Away, but one of the side-effects was that Puss and Donkey had switched bodies. Donkey's voice came out of Puss, and vice versa. They saw that Rodeo Drive had been trashed, with graffiti visible everywhere. There was also an out-of-control carriage driven by witches, and rampant crime was visible (a pick-pocketing Little Red Riding Hood). Pinocchio was locked up in a street-side marionette theatre, where they learned that Charming had also locked Fiona away, and that he was preparing a one-night threatrical show that evening, entitled "It's a Happily Ever After After All" -- supposedly it would be "Shrek's Final Performance." A group of Charming's armored royal knights surrounded them, but Artie convinced them to back off by calling Shrek the star of the scheduled performance. During that afternoon, Prince Charming was rehearsing his lines for the play. He practiced killing Shrek, in order to give the Kingdom the 'happily ever after' that it deserved. Shrek (and his pals) confronted and menaced Charming in his dressing room, but Charming pressed an alarm button inside a statue of his Fairy Godmother to alert his guards, and the group was taken captive. Charming laughed in the face of young Arthur who was "supposed to be the new king of Far Far Away." As Charming held a sword to Artie's throat, Shrek decided to save Artie - confessing that Artie wasn't really the next in line to the throne: "I wasn't right for the job, so I needed some fool to replace me. And you fit the bill." As a result, Charming released Artie, who replied to Shrek: "You were playing me the whole time," and then stormed off. 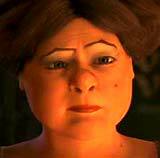 Shrek's two identity-switched pals were taken to the prison holding Fiona and the princesses, where they told Fiona and the others about Charming's conspiratorial plot to kill Shrek during the play. Fiona was aggravated by the passivity of the other princesses, but Queen Lillian proved herself by head-butting the wall and creating an escape route. 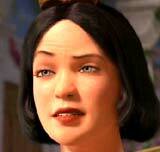 Fiona vowed to lead them to rescue Shrek and "take care of business." Just outside the castle in some gardens where two Evil Trees stood guard, Snow White summoned forest creatures to herself, and then ordered them to attack, as Princess Fiona and the others followed and burst through the gates and climbed the castle wall to its rooftop. At the same time at the Far Far Away Zoo, Donkey and Puss freed the Dronkeys, then went to Rodeo Drive to help Pinocchio escape from his marionette theatre and the Gingerbread Man from a bakery store window display. They also freed the Big Bad Wolf and the Three Little Pigs to assist. 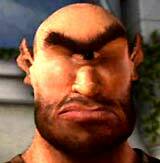 They came upon Artie, who felt used by Shrek. They explained how Shrek had only lied to protect and save his life: "It's not like it seems..."
The stage play commenced, with the dashing and brave Charming riding to the rescue of a trapped Rapunzel in a tower. A shackled Shrek was lifted to the stage, where he was about to be killed by Charming's sword - but he caused the audience to laugh when he contemptuously ridiculed Charming's acting and singing: "Well, it can’t be any more painful than the lousy performance you’re giving...Could you kill me and then sing?" All of a sudden, Dragon and the Fairytale characters, and then Puss and Donkey, and Princess Fiona and the other princesses, landed onstage to disrupt the show. Charming ordered his villain accomplices to surround the heroes, and the outnumbered forces were quickly subdued. As Charming ordered Shrek to be killed, Artie jumped down onto the stage, ordering: "Everybody, stop!" He asked: "Who really thinks we need to settle things this way?" He persuasively convinced the villains to wish to be something else with their lives: "Just because people treat you like a villain, or an ogre, or just some loser, it doesn't mean you are one. The thing that matters most is what you think of yourself. If there's something you really want, or someone you really want to be, then the only person standing in your way is you." Charming was furious with the change of events when the villains threw down their weapons, and he lunged at Artie with his sword. Shrek broke free from his chains, blocked the sword's blow with one of the chains, and prevented any harm to Artie. 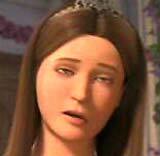 But then Charming charged at Shrek and stabbed him, apparently in the stomach. Although Charming announced: "A new era finally begins," and ordered his subjects to bow to him, Shrek stood behind him smiling, informing him that his aim had missed -- and that he needed to keep looking for another 'happily ever after.' Dragon's tail knocked over Rapunzel's tower, trapping Charming (perfectly framed in its upper window) when it crashed down on top of him, as he uttered his last word: "Mommy." Shrek told Artie that the King's crown was his if he wanted it: "This time, it's your choice." Artie decided to don the crown and become King, in front of the cheering audience. He was carried off on the shoulders of two villains. Merlin appeared in a puff of smoke and restored the rightful bodies to Puss and Donkey, but their tails were still switched. 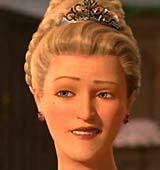 Shrek assured Princess Fiona: "I think the kid's gonna be a great king." He kissed Fiona, telling her that even though he could have been a good king himself, he had "something much more important in mind" - he touched her pregnant belly. The proud-to-be parents retired to their swamp abode, where they were soon the parents of ogre triplets, to the tune of "Losing Streak" performed by the Eels. The film ended with the exhausted parents asking: "Well, what shall we do now? ", but falling soundly asleep after caring and bedding down their new brood. But they were awakened in the night by the crying on one ogre baby (Shrek: "I got it"). With a production budget of $160 million, and box-office gross receipts of $323 million (domestic) and $799 million (worldwide). In 2011, it was the 5th highest-grossing animated film of all time. 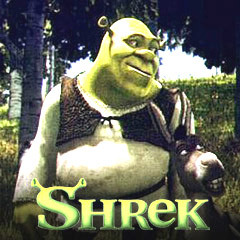 It was the second highest-grossing film in the four-film Shrek series. In 2007, it was the second highest-grossing film of the year, behind Spider-Man 3 (2007) at $336.5 million.